Dennis “HasuObs” Schneider is a professional Starcraft 2 and former Warcraft 3 player from Germany. HasuObs currently plays as Protoss in Starcraft 2. 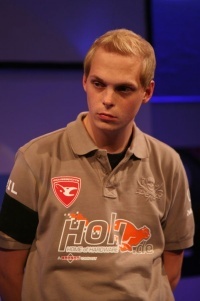 HasuObs also works for the ESL and is the Captain of Team Germany – Germany’s national team. HasuObs’ play is characterized by a preference for High Templar over Colossi, stating: My style overall vs terran is definitely High Templar based. I just love to use Storms and Feedback. Colossus are quite boring to play, thats why I prefer HTs. He has excellent micro, which is showcased in his Blink Stalker play.